Since this doesn't happen automatically, it becomes apparent you have to tell the control the names of your custom fields. You might expect this to be exposed (like many other things are) by the control properties, but unfortunately it's not that simple. There is a property (CommonViewFields), but the tool part doesn't provide a UI to enter a value. This means that the value can only be supplied by digging a little deeper and changing the definition of the CQWP using it's .webpart file. This involves exporting the web part from a page which uses it, amending the CommonViewFields element in the XML, then re-importing the .webpart file to the Web Part gallery. This new definition can then be added to your page, and you'll then get the right results. Hmm. Why is it not a property on the control again?! 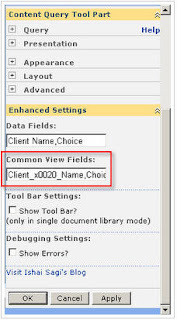 Ishai writes about this at http://www.sharepoint-tips.com/2007/06/adding-custom-fields-to-enhanced.html. His 'Extended Content Query web part' can be downloaded from http://www.codeplex.com/ECQWP. Definitely worth a look if you use CQWP regularly.